DeDee Cai, the owner of Fit to Profit, teaches leaders and entrepreneurs how to unlock their peak performance by being physically and mentally fit. DeDee founded Fit to Profit because she wanted to find fulfillment in her work, use the talents that were given, and follow her purpose. And, she wants you to be able to do the same while being happy and healthy! DeDee has a gift for clearing away the mental blocks that entrepreneurs tend to trip over. She helps her clients overcome challenges so they can be successful and fit to run a profitable business. She spreads positivity and good fortune so our lives, health, wellbeing, and businesses are holistic and reflections of our own inner spirit. If You Missed The District Bliss Vendor Social At The Gallery At Elevate, You’re Going To Be A Littttttle Bummed When You See These Photos Because They’re Gorgeous And You Can Just Tell How Much Fun We Had! Hands on. Q&A. Move forward in just one day! Missed our Couples Social with Mervis Diamond Importers at District Winery in DC? Check out the Photos! We had an absolute BLAST at our Couples Social at District Winery earlier this month! Calling all Creatives! This FREE ONLINE Workshop is not to be missed! New events in DC and Carlsbad that you don’t want to miss! Put a Spring in your Step and Join us for some Rad Events! Woohoo! We are SO ready for warm weather! Who’s with us?! We have so much in store for you over the next few months, including Vendor Socials, Workshops, and DIY Events! Stay up-to-date with our calendar or visit our blog! Meet Mabely Q’s founder and owner, Erin Perkins! Founded in early 2018, Mabely Q offers graphic design, branding, and virtual assistant services! Erin is one of our insanely amazing District Bliss Community Members and we couldn’t be happier to have her! Her input is invaluable during our Building an Empire roundtable meetings AND she is the District Bliss Sara-Organizer/Sanity-Saver (aka assistant). She manages email, schedule, our business management software (17hats), and so.much.more! We just love her! We have TONS of upcoming events, so be sure to swing by the District Bliss calendar and grab tickets before they’re gone! And, check out these gorgeous photos from our Vendor Social at Asian Fusion Gallery in Washington, DC! We host the raddest, most hip networking events across the USA! Owning – or starting – a business is not easy. 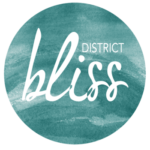 District Bliss brings together a supportive community to share this journey. We provide a welcoming, stress-free environment! For each event, we work with a select group of creatives to curate each Vendor Social – so, all of our events are unique. These laidback networking events accommodate an intimate group of people who can grab a cocktail, mingle, meet other like-minded professionals, and have a good time! We love to introduce our guests to small businesses and creatives, provide inspiration, and help you build quality connections! Throw kindness around like confetti!